Imperial Sugar provided me with sugar for recipe development in conjunction with #choctoberfest. All opinions are my own. Perfect single sized chocolate cakes drizzled with a chocolaty glaze and topped with peanut butter whipped cream. They are a little indulgent and perfect for a party! Sometimes you just have one of those days when you need a whole cake. Like to yourself. The whole dang thing! No? Just me? Forget I said anything! Starting over. There is something extra fun about mini desserts and extra big desserts. Can we agree on that at least? Whew! Whether your motivation is being able to say you ate a whole cake on your own or you just think these mini bundt cakes are the cutest thing you've seen in a while, do yourself a favor and make some. 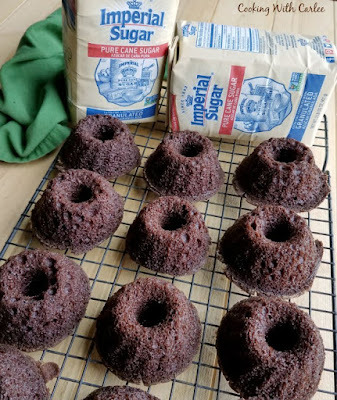 Of course having a mini bundt cake pan helps a lot, but you can also bake the batter in cupcake pans and serve them upside down as individual cakes as well. Just put less batter in the wells than you normally would so the make little cakes and not domed cupcakes. I knew I wanted a moist chocolate cake for these little gems to really drive the #choctoberfest theme home. 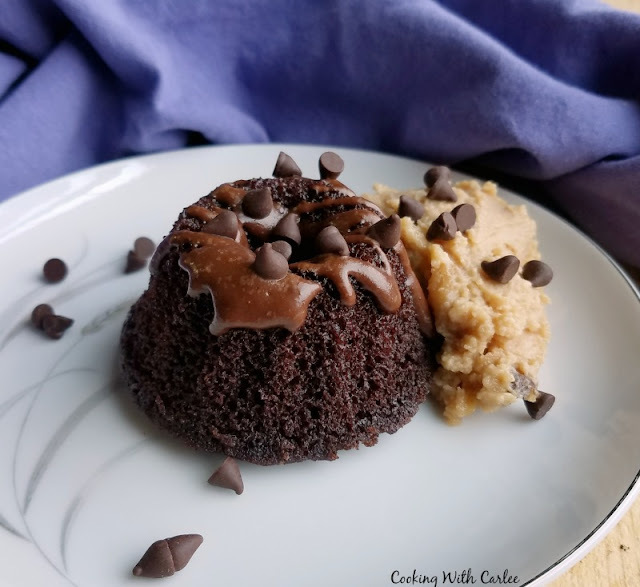 So I did what I do every time I need a great chocolate cake base, I went straight to the devilishly good chocolate cake recipe. I can't help myself, I love that recipe. Of course I am a frosting girl, but frosting those mini cakes would be a pain. So I made a quick chocolate glaze to drizzle over them. Then to take them to the next level, I whipped up some brown sugar peanut butter whipped cream. 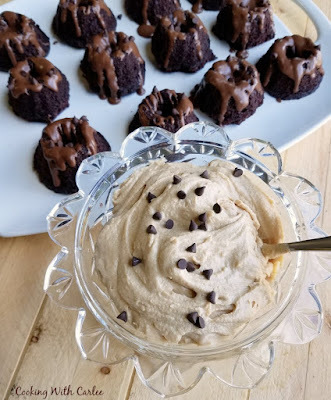 I saw how beautifully peanut butter and cream whipped up when I was tinkering with peanut butter chocolate chip no churn ice cream and I've been waiting for the right moment to pull that little nugget back out ever since. Luckily Imperial Sugar was nice enough to send us a boatload of sugar to do some baking. I used a bit each of the granulated sugar, powdered sugar and brown sugar in these beauties and I am set for holiday baking season! I hope my oven is ready! Now you just need to dream up an excuse to whip up some of these delicious beauties. If you don't have enough family and friends who like moist chocolaty cake, rich drizzles of chocolate goodness and a side of the best parts of dense peanut butter and fluffy whipped cream... invite me! I'd happily help you eat these up! Preheat oven to 350F and grease mini bundt pans or cupcake pans. In a large bowl, mix together the sugar, cocoa, flour, baking soda and salt. In a second bowl, mix together water, oil, vinegar, coffee and extracts. Pour wet ingredients into dry ingredients and mix until just combined. Scoop just shy of 1/4 cup of batter into each well. Bake for about 15 minutes or until cake tests done. Cool in pans for about 5 minutes and then turn out onto wire rack until cooled completely. Whisk together powdered sugar and cocoa powder to combine. Add cream and stir until smooth. Adjust consistency with cream or powdered sugar until you reach your preferred drizzling consistency. Put your peanut butter and brown sugar in a bowl. Place that bowl and your beater in the freezer for 5-10 minutes. Beat peanut butter and sugar until smooth and then add cream. Slowly beat to incorporate and then beat on high until you form stiff peaks. Not only are these darling but the YUM factor is off the charts with the peanut butter cream on the side!!! I know I wold probably want to pop a whole one in my mouth..these photos have me drooling!! I want to go in chocolate heaven by eating one of these!! 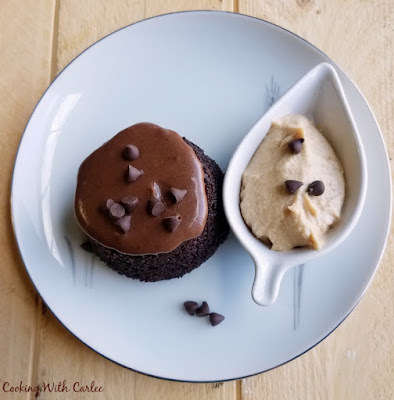 The cakes,the chocolate glaze and the peanut butter whipped cream all are so delicious together!! It was a match made in heaven! Thanks, Deepika! Peanut butter + chocolate +mini anything = YASSSSSSS! These are adorable and look sososo good! Why do mini desserts have to me so darn cute?! Thank you! How fun for each of us to have our own individual cakes. I love the idea. Thanks for sharing. That way you don't have to share ;-) Thanks, Amy! I love mini desserts anyway, but you made my favorite into a mini dessert. Peanut butter and chocolate - yum! Aren't mini desserts the best? Especially when there is chocolate and peanut butter involved! Great way to celebrate Choctoberfest! Love the idea of individual desserts perfect for parties great recipe and the combination is a winner. I love individual desserts as well. It is so fun to get your very own cake! Thank you! Best way to yield to your cake craving than dig into one of these mini cake! I'm sure it feels like your eating a whole one :) sounds absolutely divine! It is so much fun to serve yourself up a whole cake! Thank you! I love choctoberfest! Such a fun event every year. I think these little individual bundts would be a HUGE hit at my house. I must give these a try! I love it too! Any excuse to play with chocolate is a good one in my book. I hope you love these! They are so cute! Totally love chocolate and PB. Our oldest hates PB, basically anything that tastes of peanuts, and serving the PB whipped cream on the side is a perfect idea! 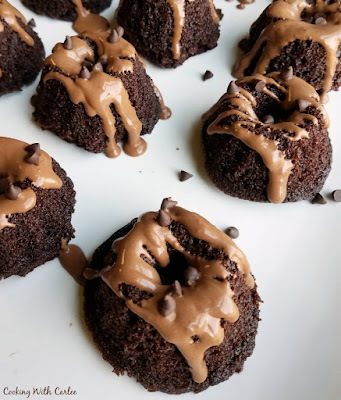 Carlee, these mini chocolate bundt cakes look amazing! I love the peanut butter with the chocolate glaze! Thank you so much! They were a big hit here! This will be a sure hit at my house as we all have sweet tooth. The peanut butter + chocolate glaze is a plus factor too. It sounds like I would fit in at your house then ;-) Thank you! I'm crazy about mini just because they make you eat guilt free... ha! I would so go popping these in my mouth. The peanut butter with whipped cream sounds so delish..! YUM! Definitely guilt free! ;-) Thank you so much! Looks so yummy! And thanks for linking up at Friday Frenzy Link Party! I hope you link up again next week :) PINNED! They really are, I promise! Thanks, Kelly! These are so cute and look delicious! Always obsessed with anything chocolate and mini. Definitely saving and hope to make these for my next gathering! Me too! Give me all the chocolate and mini desserts! I hope you love them! Love this mini chocolate bundt cakes, I can eat few without feeling guilt. these wonderful treat that peanut butter cream sounds really nice. Definitely no guilt, just smiles! I love the mini size of these, they're terrific. They sound super tasty and I know they wouldn't last long at my house. This is a chocolate lovers dream come true and there are many days when I just want one whole to myself and not feel guilty later for eating the whole thing. These mini versions would certainly help me for that. Chocolate and peanut butter! What a perfect combination! Although you said it would work with the large cupcake tins, the little bundt cake shape is so adorable. The drizzle of frosting finishes it off beautifully. The little bundta are so cute, they really are the way to go! These sound amazing! 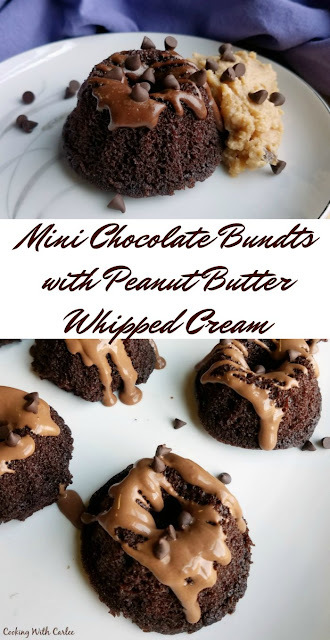 I am a chocolate lover at heart, so these are right up my alley. That peanut butter glaze, though, sets this up for complete happiness. The peanut butter whipped cream really does take it to the next level! Your bundts look absolutely perfect!! I love chocolate and peanut butter together. Oh my YUM! I am licking my lips! So glad you shared this recipe with us at Merry Monday! I wish I could share one! Thanks, Shirley! Mmmmm.... I love mini bundt's, my own little cake that I don't have to share! Aren't they the best?! I love having my very own dessert! Hi Carlee, the perfect pudding for the Moroccan lamb dish! Believe me when I say I don't need a small cake to eat the whole thing... I saw some mini silicone bundt tins the other day but passed them by as I didn't think I'd use them... You have now got me rethinking! Run back as fast as you can! ;-) Thanks, Debbie!